Deus Ex is being augmented with another Deus Ex. After a nonsensical ARG and an entirely sensical leak, we now have official confirmation of Deus Ex: Mankind Divided. 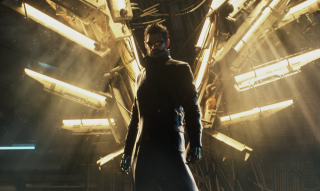 Once again, it'll feature Deus Ex: Human Revolution protagonist Adam Jensen, who this time says things like, "sometimes you just have to let go and embrace what you've become." From the sounds of it, he'll be going up against some shadowy organisation and, for some reason, an augmented version of the Heavy from TF2. "Deus Ex: Mankind Divided directly follows the aftermath of the Aug Incident, a day when mechanically augmented citizens all over the world were stripped of control over their minds and bodies, resulting in the deaths of millions of innocents. The year is now 2029, and the golden era of augmentations is over. Mechanically augmented humans have been deemed outcasts and segregated from the rest of society. Crime and acts of terror serve as a thin veil to cover up an overarching conspiracy aimed at controlling the future of mankind…"
A press release promises new augmentations, new locations, and a "cloak of conspiracies". That, I'd imagine, is a metaphorical cloak—otherwise the conspirators would be all too easy to identify. In addition, the PC version is confirmed to support DirectX 12 and AMD's TressFX technology. Expect some seriously augmented beard stubble.